SRINAGAR, OCTOBER 15: Zafar Iqbal Manhas, MLC called on Governor Satya Pal Malik at Raj Bhavan today. Manhas, extending his warm greetings on his maiden meeting with the Governor, apprised him of the pressing problems being faced by the local population. 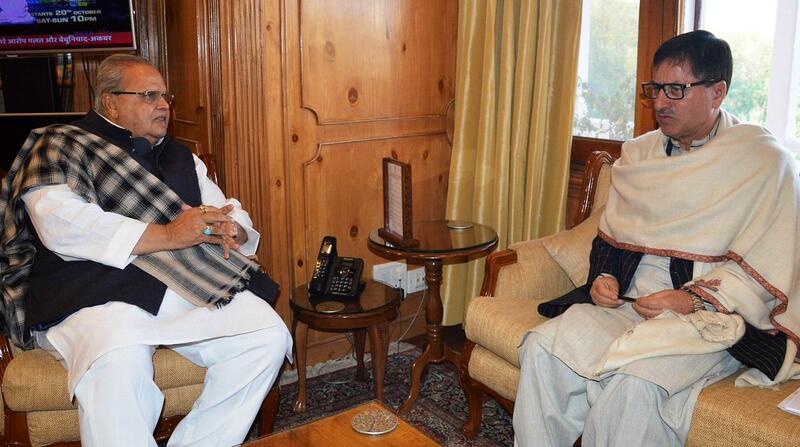 He informed the Governor about the overall Socio-political situation prevailing in the Shopian district. Besides, he also informed the Governor about the affairs of Jammu & Kashmir Academy of Art, Culture and Languages of which he is the Vice-President. The Governor urged Sh. Manhas to assiduously work for the welfare of the people, besides, ensuring that the Academy fulfills its mandate in the right spirit.